These are photographs taken by Jonathan Clark over several years in southwest Florida. He stood in the same spot on a bridge overlooking a bayou off of the Gulf of Mexico. 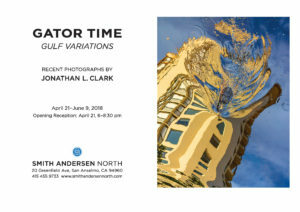 The photographs are of the reflections of the sky, a building, and an alligator. The water is sometimes disturbed by rain, illuminated by sunshine, or colored by sunset. Every image is different. The alligator’s head moves and causes ripples. Green dots of algae, the sequence of distorted squares that are the building’s windows offer a painterly excitement. The three dimensionality of the images in the water adds the shapeliness so satisfying in sculpture. And yet, this collection reveals the genius of photography. It captures a moment, the truth of each moment. Unique and disappearing, there is the world in each moment. Look, it’s gone; look again, it is completely different and then gone; look, snap, look, snap: gone. This photographer’s art conveys a philosophy without ever pressing it forward. This is art that is above the trends of manipulated images. 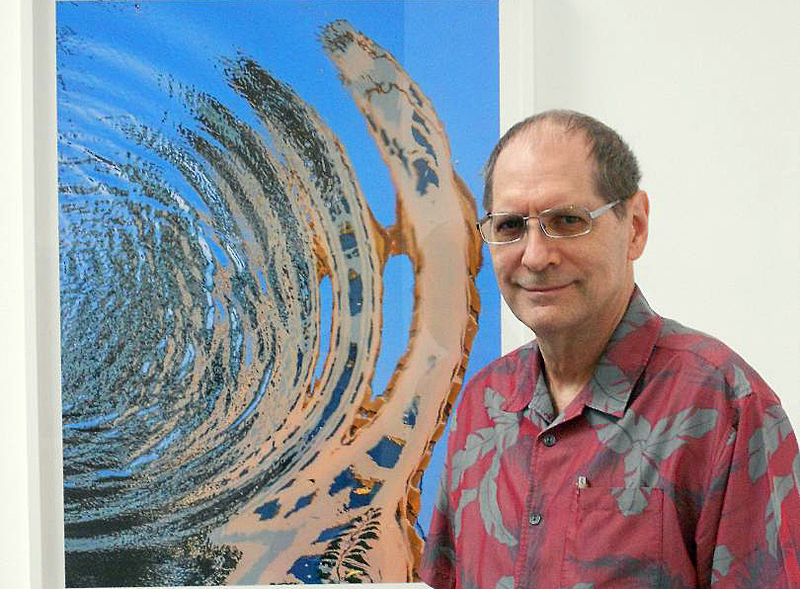 In his eloquent artist’s statement, Clark wrote: “The interplay of substance and reflection becomes a dialogue with nature, creating ever-changing metaphors of reality that the camera alone can capture and preserve.” Jonathan Clark’s work is in collections such as the Museum of Modern Art, New York; Getty Library and Museum, Los Angeles; Bibliotheque Nationale, Paris; Smithsonian Institution, Washington, D.C.; Museum of Modern Art, San Francisco, as well as distinguished private collections. This entry was posted in Hedgehog Highlights and tagged alligator, Florida, Jonathan Clark, painting, Photography, sculpture, Smith Andersen North gallery, Susan Embers on June 27, 2018 by Leslie.